Good morning! Is anyone else just dying for a taste of spring? A little warm sunshine…. a trip to VA wine country… the excuse to throw the windows open and let in fresh air? Your calendar is actually wrong. February is the longest month of the year. The Peeps diorama contest is back! A peek into the McDonald’s test kitchen. Frank Bruni wonders at the competitive smugness that surrounds dining in elite restaurants. The Bitten Word has advice on selecting a CSA. Young & Hungry reports on the sweet new shop taking up residence in Takoma Park, MD. Get the ins and outs of a Taiwanese night market from The Upstart Kitchen. Would you pay $110 for a bowl of ramen? Best Bites Blog reviews La Fromagerie in Old Town. Ben & Jerrys announces plans to go all-sustainable with their ingredients, meaning each item will be from Fair Trade Certified resources. Looking for a hearty vegetarian dish? Try The Garden Apartment’s roasted portabella with quinoa. Restaurant Refugee mourns the loss of Polly’s on U St. Endless Simmer wants you to spill the beans on your dream donut. We don’t usually write about a restaurant the same night we eat there, but there are a couple of circumstances that come together to make tonight an exception. For one thing, this wasn’t our first rodeo…we’ve eaten at Tallula before and had a great meal every time. More important, though, is the fact that one of the recommendations we’re about to make has a distinct expiration date: this Sunday. Along with its fellow Neighborhood Restaurant Group establishments, Tallula is celebrating the Olympics. Each of the six properties has adopted a country, and they are offering special food and beverage options that reflect that country’s cuisine. 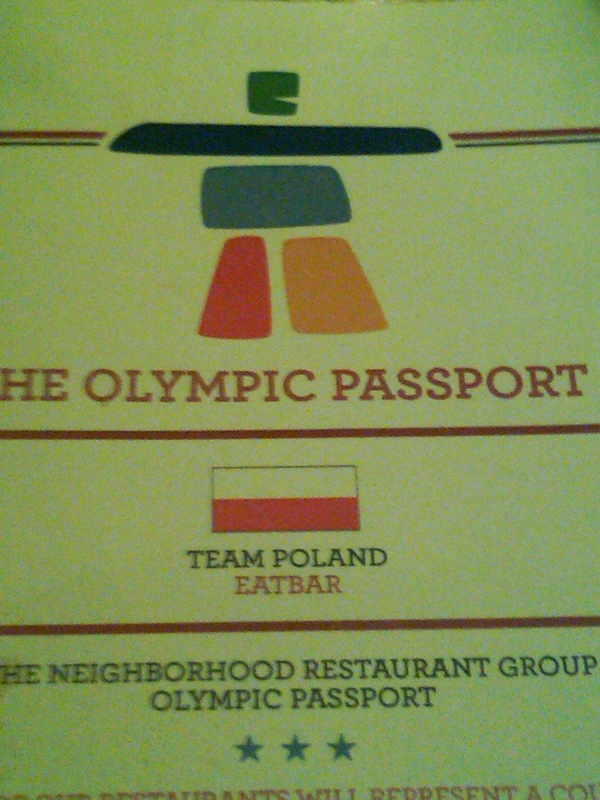 Get your “Olympic Passport” stamped at all six restaurants, and you earn a $50 NRG gift card for use at any of the six. You’ll also be entered into a drawing for three grand prizes during an outdoor celebration at Evening Star Cafe on Sunday. If you’re just getting started, you may have a tough time hitting all six in time to make the drawing (though it can certainly still be done!). Of all the Olympic menu items, there was one in particular that caught our eye (okay, two if you count the poutine at ChurchKey). We’re suckers for a good pierogi, those Eastern European pockets of dough stuffed with delicious, hearty fare like potatoes. When we saw that Chef Barry Koslow and his crew at Tallula were taking them on, we knew where we’d be heading. In an effort to eat healthier, Mike and I have been hitting up a string of sushi haunts in and around DC. That there is such a palette of sushi options – each with a distinct experience and take on the cuisine – is a great testament to the mainstreaming of sushi in America. I stepped into Current and immediately thought I was in the wrong place. Had I stumbled into a skinny jean-eyeliner convention? Music pulsed through the moodlit restaurant where the bar and all available tables were bumping along with it, even on a cold Tuesday night. Current took up residence where Dragonfly, a sleek lounge, used to be and it seems that the remodelers had to work around the clientele who never left. The scene still focuses on the club/lounge element but serves its bold and beautiful patrons light fare such as sushi and a handful of other Asian-themed dishes. 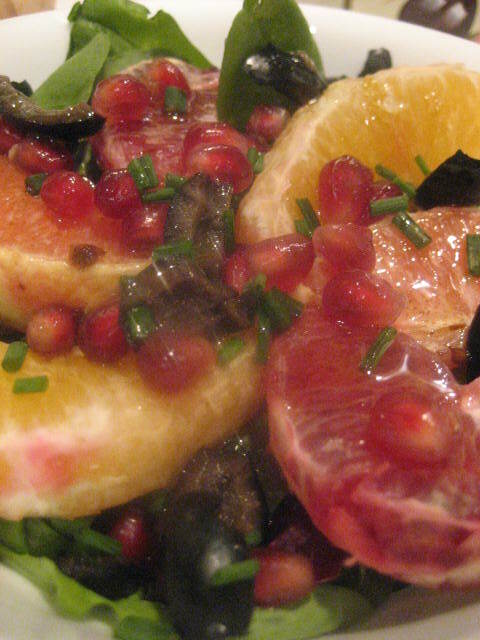 We split a dish of crunchy seaweed salad nicely balanced with a citrus zest. The vegetable and shrimp, served with a light lime-ginger sauce, come with a surprsingly delicate wrapper, succeeding with a light touch where many kitchens go thick and gluey. Sushi was decent but standard fare. 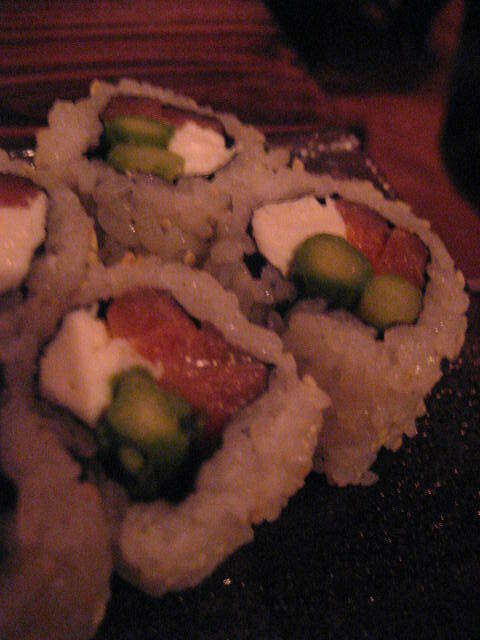 The standout dish was a curious combination of tuna, fresh mozzarella, and asparagus – a surprisingly fresh flavor trio. 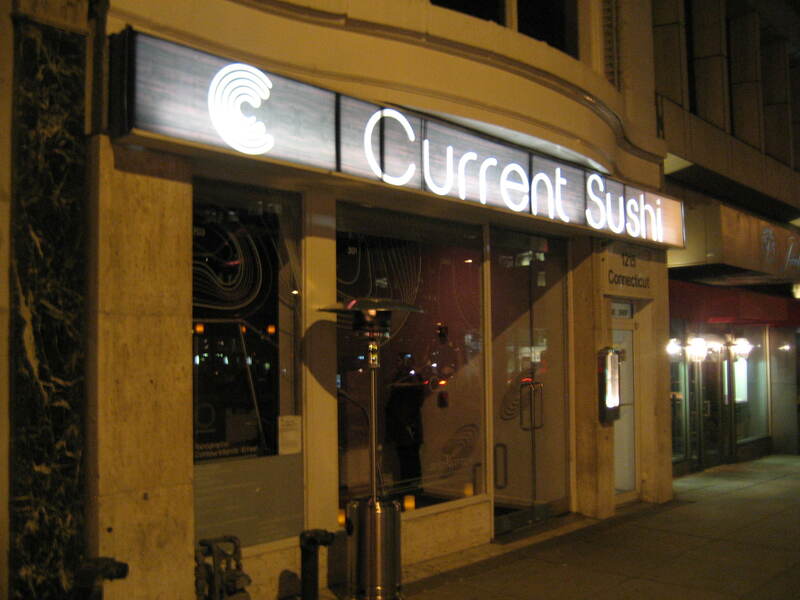 Current isn’t in the running to be a regular sushi haunt for us but it is worth a try. I can see it playing the perfect platform for dinner before an upscale girls night out. Momo Sushi, on the other hand, is fast tracking its way to our new favorite sushi destination. It features exactly the perfect qualities that draw us in: fresh, creatively prepared fish, relaxed atmosphere, off-the-beaten path location and friendly service that recognizes a repeat customer. Momo Sushi, slipped into a narrow townhouse in Queen Street, is several blocks away from the most well-worn sidewalks of Old Town. In case you haven’t noticed, there are a lot of Washingtonians who blog in what passes for free time. 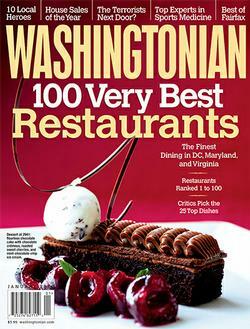 Washingtonian magazine has definitely noticed, and they’ve been doing readers a service by highlighting a blog every Wednesday in their “Blogger Beat.” That’s right – a blog about bloggers. A few weeks ago, we were contacted by Emily Leaman to see if we’d be interested in participating. As if there were any doubt. The results are up today. Check it out! Travel Tuesday: Hudut? You Better Belize It! With all the snow we’ve gotten this winter, the idea of getting away somewhere tropical and warm is more appealing than ever. Although we weren’t able to escape this year, we did just that a year ago to celebrate our birthdays. 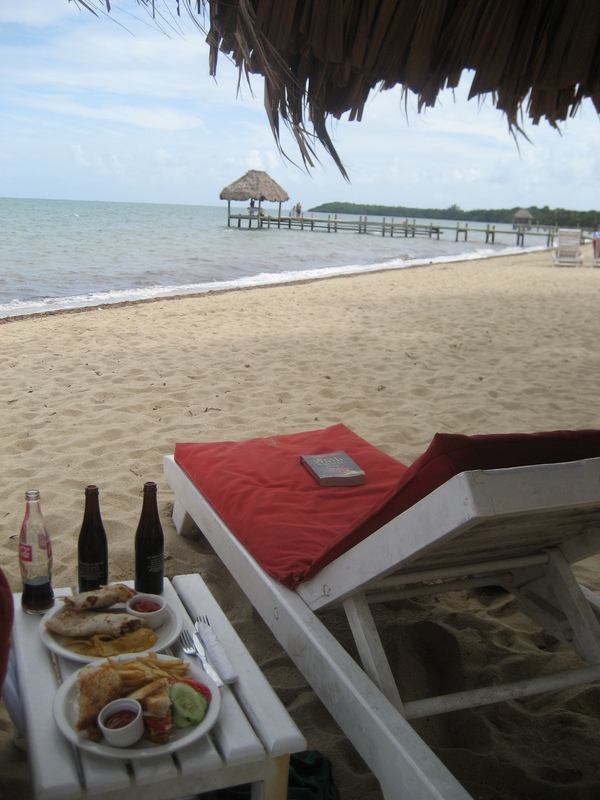 We rang in 2009 at Jaguar Reef Lodge, an all-inclusive resort in Belize. The resort was wonderful. The excursions blew us away. The food…not so much. Don’t get me wrong. Most of the dishes we ordered were tasty, and the portions were certainly generous. But I was hoping for something a little more authentic than chicken nachos and conch fritters, so I found myself selecting the menu items that seemed to be closest to the kinds of dishes a local might eat: rice and beans with stewed pork, grilled fillet of snapper with fruit salsa, etc. Even so, authenticity seemed to elude me. 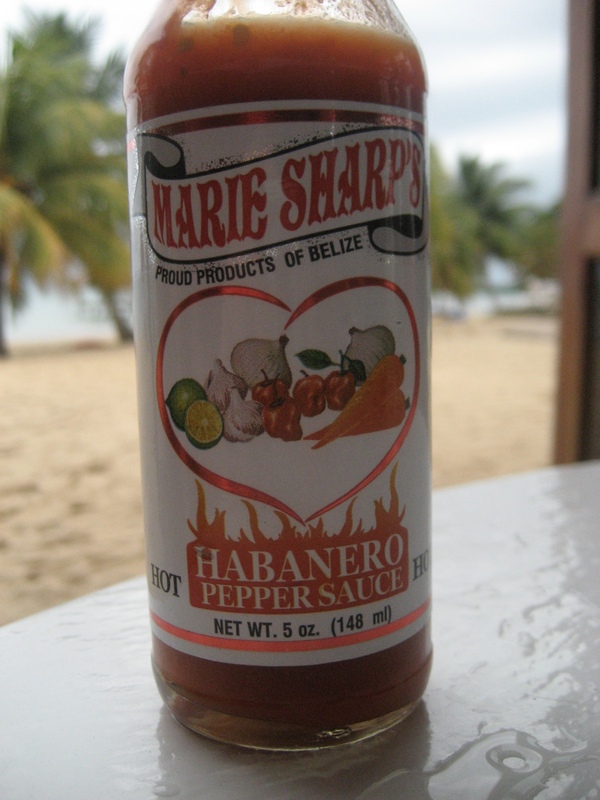 I was getting my fill of Belikin beer (regular and stout, thank you) and seasoning my meals with a healthy dose of Marie Sharp hot sauce, but I was eager to see what a local meal really looked like. So I borrowed a bike from the resort one afternoon and headed down the road to nearby Hopkins Village. It was there, in Hopkins, that I finally experienced a truly local dish: the Garifuna fish stew known as hudut. I’m not sure exactly what I was expecting, but everything about the experience was unique. If you’ve got a special someone to impress, Valentine’s Day really does take things to a whole new level. Sure, we all talk a good game about what a made-up, commercialized holiday it is, and how we really don’t even understand what all the fuss is about in the first place. But even couples who make a pact to ignore the day are loath to tempt the fates and skip the romance altogether. Seems like a perfect opportunity to celebrate with a nice meal, right? Unfortunately, Valentine’s Day ranks right up there with New Year’s Eve on the Capital Spice “worst times to dine out” list. Prix fixe menus (often at inflated prices), crowds of diners and a general lack of inventiveness mean your meal is unlikely to deliver the romantic message you wanted it to. A better – if not always safer – option is to take what you know about your Valentine’s likes and translate them into a home-cooked meal. This year , I took the chance to cook up a three-course dinner for Elizabeth, with the goal of putting together a restaurant-quality meal in our new kitchen. Along the way, I came across a couple of recipes that are likely to make future appearances in my cooking repertoire – a bright, citrus salad from Jose Andres, a savory duck breast/pear combination and a pie that would bring tears to Mrs. Fields’ eyes. 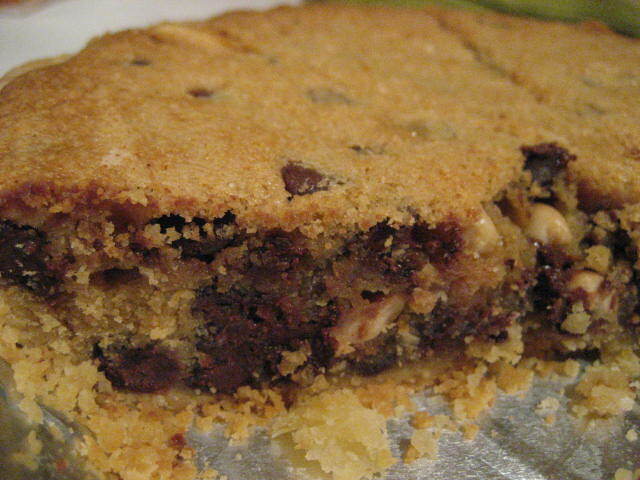 Colors, flavors and peanut butter cookie pie after the jump. Even before the first DC Food Blogger Happy Hour ended last September, there were plans to do it again the following month. The enthusiasm, the camaraderie and the fun were too good to let it go as a one-and-done thing. But even the organizers had their doubts about whether the happy hours could last through the winter months. On March 3rd, we’ll be holding the seventh monthly event. This time we’ll be at Vinoteca, just off of U Street on 11th. Come join us for a glass of wine – or a few. Take advantage of the fact that you’re just a short walk from the Metro – and a slightly longer walk from Ben’s Chili Bowl. The folks at Vinoteca have graciously offered to extend their normal happy hour specials for an additional hour, so we’ll be able to enjoy discounted menu items and as many as 20 wines by the glass for $5 each throughout the event. 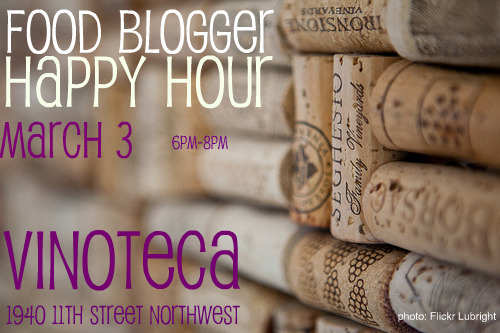 If you haven’t joined us for a Food Blogger Happy Hour yet, you’re missing out. It’s been truly impressive to see the way the local blogging community has really come together at these events over the past half a year. And I know there are bloggers out there who can attest to the friendships they’ve solidified and the connections they’ve made as a result of these happy hours. At the event, take a moment to chat with the organizers and share your thoughts about future venues. We’re always looking for new ideas and we want to continue to highlight great locations in new neighborhoods throughout the area. And this month, they’ve added another way to stay in touch with your fellow food fans and bloggers: a Facebook Fan Page. With more than 80 fans and counting, it’s a great snapshot of the DC food blogging community and a way to keep up to date on where and when events are happening.